This post features a bunch of recipes. Not only is there the salad and dressing, but I also want to share this simple way to make baked chips. I served it with leftover vegan cashew avocado “cream” from these incredible tofu tacos I discovered on Love and Lemons. Put some chopped romaine lettuce in a bowl. Top with the following: I chose to do it cobb-salad style, but you can toss it all together, too. Go loco. You can also do: avocado, jicama, etc. Prepare oil: Mix together a few tablespoons of olive oil with spices of your choice. I did a few shakes of cumin and paprika, and then a few pinches of salt. Arrange tortilla triangles in a single layer on a cookie sheet (no overlapping) and brush both sides with the oil mixture. Bake for 20-25 minutes, or until slightly brown and crispy. Serve with salad and dip of choice. This soup is smoky and spicy. (To turn down the heat, use less chipotle chili powder). You can make a meal of it by serving it with a crusty bread and a green salad. I found the recipe in Williams Sonoma’s catalog. It is called, “Sussman Brothers’ Roasted Corn Soup with Tomato.” I did a little research and learned that Eli and Max Sussman are the chefs at Mile End and Roberta’s, two of my favorite restaurants in Brooklyn. It is no surprise that this recipe was a winner. I had never cooked a red pepper as described in this recipe. I was doubtful, but it turned out well. Preheat an oven to 375°. Put the tomatoes in a lightly greased glass baking dish. Roast until the skins darken and the tomatoes are caramelized, about 30 minutes. Remove from the oven and let cool. Keep the oven on. Spread the corn in a single layer on a baking sheet. Roast until the edges begin to turn golden brown, 10 to 15 minutes. Meanwhile, when the tomatoes are cool enough to handle, peel off the skins and discard. Set the flesh, with the juices, aside in the baking dish. Remove the corn from the oven and let cool. Place 1 bell pepper on each of 2 gas burners. Turn the burners on high and sear the peppers directly over the flame, using tongs to turn as needed, until the skins are blackened all over, 10 to 15 minutes total. (Or place the peppers under the broiler and broil, turning as needed, until charred and blistered on all sides, about 15 minutes.) Transfer the peppers to a brown paper bag and close tightly. Let stand for 15 minutes, then remove the peppers from the bag. Remove and discard the skins, core and seeds. In a soup pot, combine the tomatoes, bell peppers, yellow and red onions, garlic and corn, reserving a handful of the roasted corn for garnish. Add just enough broth to cover the vegetables and bring to a boil over high heat. Reduce the heat to medium-high and cook until the vegetables are very tender, about 10 minutes. Stir in the chili powder and salt. 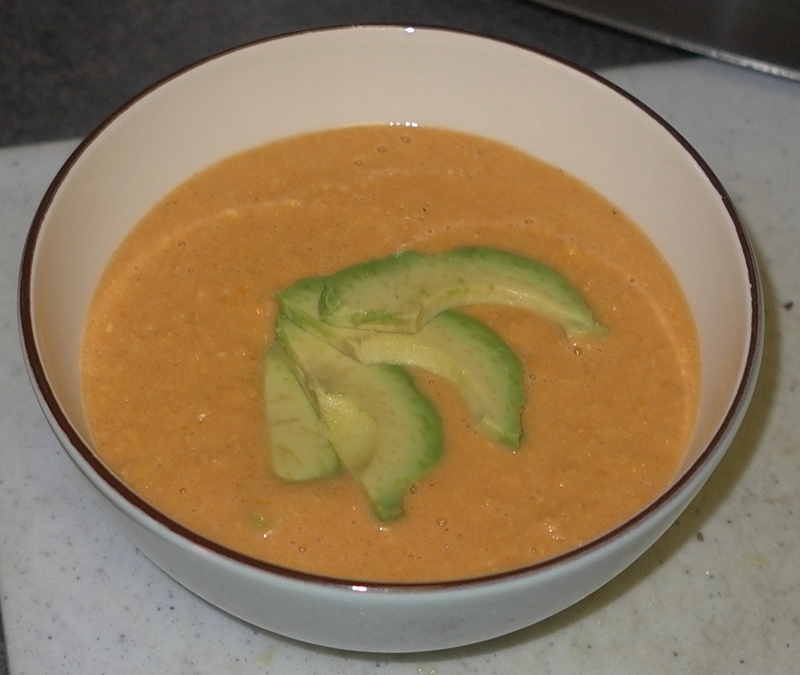 Using an immersion blender, blend the soup until smooth. While blending, slowly drizzle in the cream. Ladle the soup into individual bowls. Garnish each portion with a couple of avocado slices, a few drops of olive oil, a scattering of the reserved roasted corn and a sprinkle of paprika. Serve hot. Serves 4. 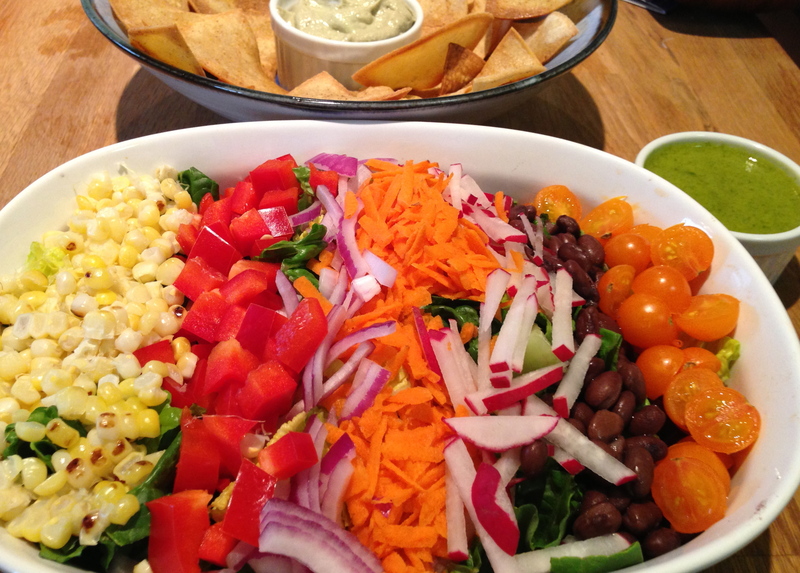 This is basically an easy fresh salsa over a bed of greens. We arrived in Indiana after a long day of traveling, and I wanted a salad with a bunch of Sweet Corn Charlie’s vegetables. Okay, so the avocado is not from Indiana, but the others are! Kernels from 1 ear of raw sweet corn–must be very fresh! 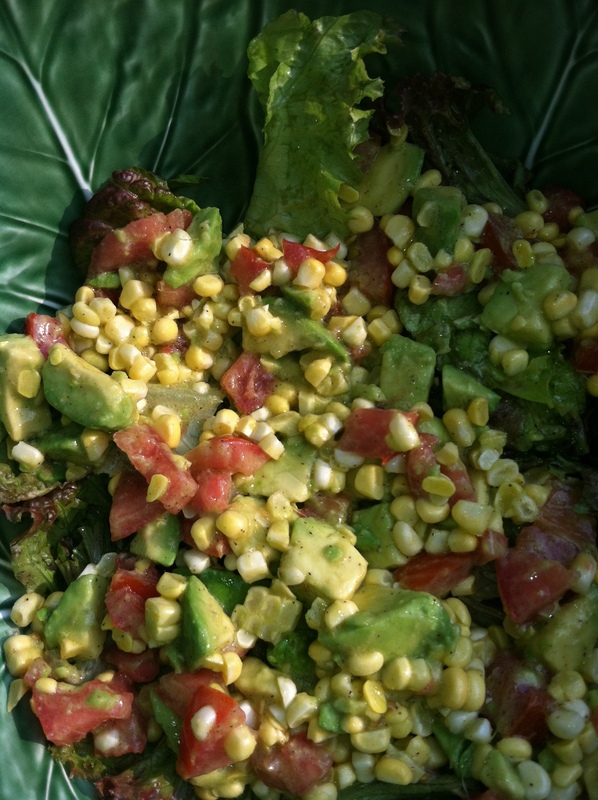 Mix together chopped avocado, tomato, and corn. Add olive oil, lemon, salt and pepper until thoroughly coated. Pour mixture over greens. Enjoy! 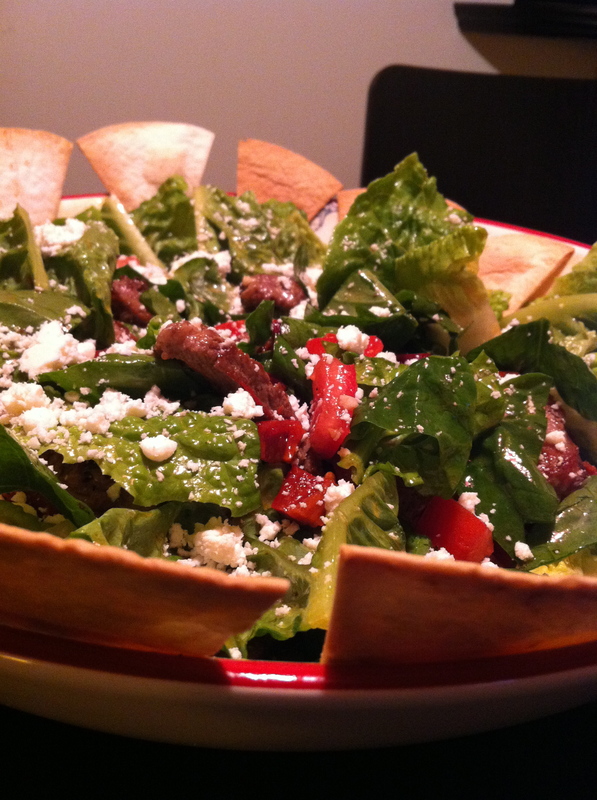 This salad is a slightly different take on Rick Bayless’ version in Mexican Everyday. Combine all the dressing ingredients in a blender and blend until smooth. Pour into a jar and secure the lid. In a large bowl, combine salad ingredients. Give the dressing another shake to make sure it is combined. Drizzle about 1/3 cup of the dressing on the vegetables. (Save the rest of the dressing in the fridge for another salad). Toss to combine. Taste and add more salt if you think necessary. Serve immediately. Variations: You can add toasted pine nuts, diced mango or goat cheese. This recipe was adapted from Rick Bayless’ Mexican Everyday. 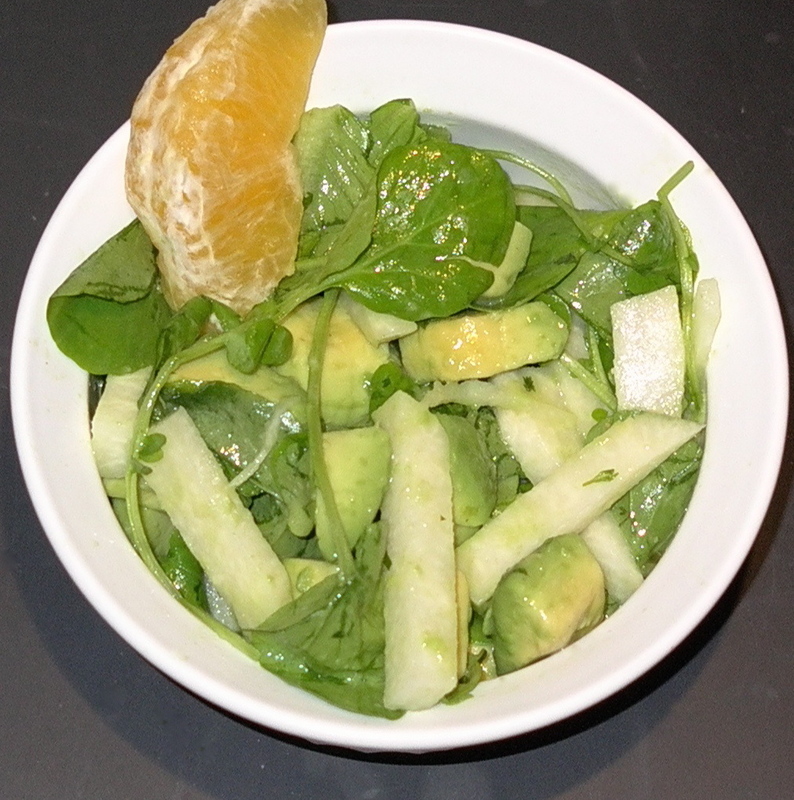 He suggested using frisee or escarole, but we had baby spinach and romaine–so we used that. We also substituted the suggested queso anejo for cotija cheese. Scoop the greens into a large bowl. Spread the tomatoes and avocados over the top. Set a very large (12-inch) heavy skillet over medium-high heat, and measure in 2 tablespoons of the oil. Sprinkle both sides of the skirt steak with salt and pepper. Lay it in the hot oil and cook until it’s about medium-rare, 1 to 1 1/2 minutes on each side. remove to a cooking rack set over a large plate–this keeps the juices in the meat rather than running out onto the plate. Turn the heat under the skillet to low. Add the garlic and stir for a few seconds, until very fragrant. Then pour in the broth (or water) and stir to release any browned bits on the bottom of the skillet (the liquid will quickly come to a boil.) Turn off the heat and add the chile, along with the lime juice and the remaining 1/4 cup oil. Season with salt (usually 1/2 teaspoon) and pepper (about 1/4 teaspoon). Cut the skirt steak into roughly 3-inch lengths, then cut each piece across the grain into 1/4-inch strips. Add to the bowl with the frisee. Pour the warm dressing over the frisee and toss to coat thoroughly–the greens will wilt slightly. Divide among four dinner plates or large salad bowls. Sprinkle with the grated cheese and serve right away.